Bill Meakes and Ross Moriarty have both received two-week suspensions for foul play during Gloucester's European Challenge Cup final win last Friday. 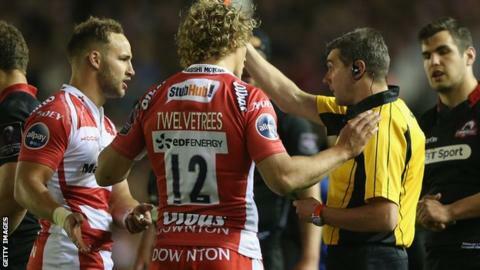 Meakes, 24, was sent off for a high tackle in the victory over Edinburgh, and has now been banned for two weeks. Flanker Morarity, 21, has also received a two-week suspension for striking a player in the back with his knee, an offence for which he was sin-binned. Both will miss Gloucester's final two games of the Premiership season.